Designed for ages 13 and up, HealthQuest Fitness Stations provide the tools and information needed to complete a total body workout for beginner, intermediate and advanced users. Each individual can work at their own pace and intensity, modifying the suggested exercises, circuits and workouts to suit their own needs. Stations are available either as a complete workout circuit program or individually, allowing customers to expand their exercise circuit as budget and space allow. The Pool Blaster® Max CG (Commercial Grade) is 33 percent stronger than the standard Pool Blaster®, making it ideal for commercial-grade use in aquatic facilities. 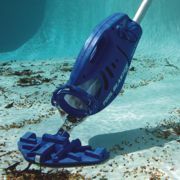 This unit is a rechargeable, battery-powered, self-contained underwater vacuum cleaner that is strong enough to clean the entire pool. From algae and sand to large leaves and debris, this unit connects to any vacuum pole and cleans without hoses—perfect for facility managers. It will work up to one hour before needing to be recharged. The toughest outdoor finish is now available on an array of seating and site furnishings from brp by bison. This line, formerly BRP Enterprises, includes bench seating, chairs, tables, bike racks and trash receptacles and more. These site furnishings are professionally designed and fabricated, then finished with a textured WeatherbeaterTM Mastercoat powder-coated finish and given a 10-year warranty. The new US250 sprayer from TurfEx features a universal mount that allows it to attach to the front of most available zero-turn mowers. This unique mounting system stays within the mower's footprint and is completely electric powered. The pump is rated at 2 gallons per minute at 60 psi, and the corrosion-resistant polyethylene tank holds up to 25 gallons. Available with an optional 48-inch, front-mounted broom for spraying directly to the ground. Yellow Klear for pools works with chlorine to combat yellow and green algae and is especially effective against yellow or "mustard" algae, a powder-like algae that clings to walls, steps and corners. Commercial aquatic facilities with pools that have rough surfaces, cracks and crevices, poor circulation or just an overabundance of nitrates and phosphates are frequently troubled by yellow algae. This product is simple to use and is effective at removing stubborn yellow algae. Little Beaver's Hydraulic Earth Drill offers an efficient and dependable solution for multiple digging and drilling projects. By combining a higher horsepower engine with the convenience of a hydraulic drive, the unit is able to drill efficiently and effectively, even in the toughest soil conditions. Built to be both reliable and powerful, the Hydraulic drill can be used for a variety of applications, including fence and sign installation and landscaping. Trans-Lux Corp. is a leading designer and manufacturer of digital signage display and TL Energy LED lighting solutions for the financial, sports and entertainment, gaming, government and commercial markets. With a comprehensive offering of LED Large Screen Systems, LCD Flat Panel Displays, Data Walls and the Fair-Play Division Scoreboards and video displays, Trans-Lux delivers comprehensive digital signage solutions for any size venue's indoor and outdoor display needs.